​4074 White Bear Ave N in White Bear Lake, MN at the corner of County Road F & White Bear Ave.
Divination Tools, ​& New Age items and Much More! Check out our "Products & Specials" page! We have a variety of services & classes available. Note: currently they are not accepted online for classes or services. ​PLEASE, watch our Facebook page or CALL the shop for the most current schedule. PLEASE - Check our Facebook page for any other changes. We try to post changes as soon as we can. Bonnie tries very hard to keep to the set business hours we have. But, it may not be possible to always be open during these hours. If you are coming from a distance, we recommend that you call the shop first to verify that we are open. ​Check out our "Products & Specials" page to find out more news on the specials for the month. Coming soon ... more singing bowls will be available! ​Drums have been ordered also. Gallery Reading with not one but three of our psychics! You have questions? 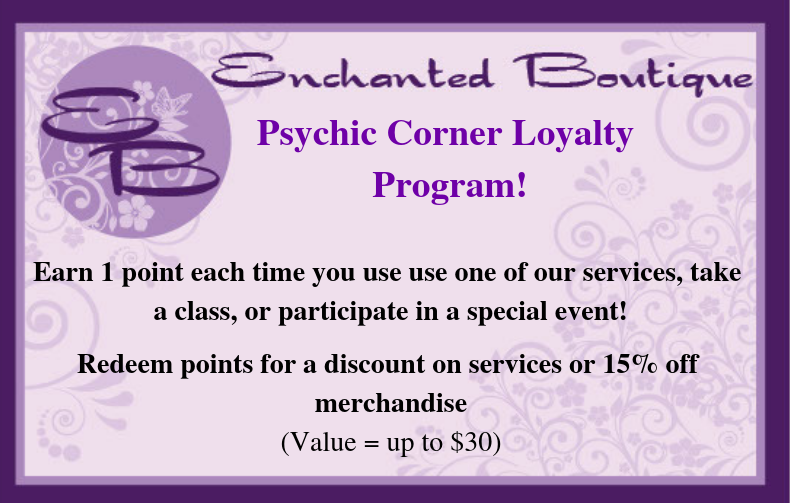 This is your opportunity to get answers or options from three of the Enchanted Boutique's psychic readers. Kris is very adept at BodyTalk and Animal Communication. Deb L. is a gifted Psychic Medium. Deb H sees the energy in and around you. Depending on the number of guests, we hope to answer everyone's questions during the gallery. $30.00/person. April 1 - 30 We are celebrating our 5 year anniversary all month! Willmar Pagan Pride - May 4 (Vending) The shop will be open. It's easier than ever to keep up with all our upcoming events, classes, and more. ​Check out our calendar to keep track of all of our amazing events. Sundays (by appointment only) with Jessica D, please call to schedule an appointment for either a photo or the chakra report. Jessica will be at most of our Psychic Sunday & Enchanted Psychic Sunday events doing Aura Photos. Please note: Reiki & other energy work are not to replace or interfere with conventional medical treatments, but to work along side it. Tarot & Oracle Readings - No matter which type of card reading you get, you can get the same type of questions answered. The type of deck vary in number of cards and type of cards (suits and arcana/trumps). Please note: The above provider schedule is subject to change. Please check our booking system or call us. Thank you. ​Akashic Record Readings -The Akashic Records are the record of your soul’s journey, past, current and future lives. This can take millennia. But no matter how new or ancient of a Soul you are, the Akashic energy holds all your thoughts, feelings, actions and deeds from each lifetime. Many people imagine the Akashic Record as a library with each book representing a lifetime. Find out how your life now is effected by the past and what you can do to improve it. Past Life Readings - Different that past live regressions, in which you are hypnotized and guided to go back in your memory to past lives. This reading is an intuitive journey looking at your past life by an other person, and can help explain a variety of things in your current life. For example certain fears or phobias that you might have and help you overcome them, based on an understanding of their origins in a past life's traumas or difficult experiences scars. Animal Communication - The process of communicating with animals who are not physically present is referred to as telepathic or 'distance-feeling' communication. Kris make this connection through your own bond with your animal companion (alive or passed) and a three-way conversation follows which can include exchanging psychic images, words, feelings and physical sensations. She works as an interpreter in a conversation between you and your animals. Photo is nice to have with, but not necessary. We now hold two kinds for Psychic Sunday events now. Both are to give you a sampling of our provider's services. Both are for the total time will be about 1 hour total, please plan on being here by 5 pm to get the full time ​in before our 6 pm closing time on Sunday. The event center and is located in the same building just two doors down from the shop. It is also available for your events! Learn more about some of the offerings we have at the Enchanted Awakenings Event Center by clicking here. Discover more of our special events! We offer gallery readings, parties, and bring in special guests. Please check our Facebook page for up to date events and other information. Sometimes, Bonnie may not be able to update the website as much as needed so she has asked our providers to add events to our calendar on Facebook, so it will be more up-to-date than the website. Schedule your appointment or class space online! This helps us plan our events, and classes. If we do not get enough registered for events, we may cancel them, which we would rather not do. ​Don't forget to check out our newsletter .... There is always a coupon in it for in store use. You don't even need to print it out, if you have a smartphone, just show us it.